This post was originally written for the Cardiff University Special Collections and Archives blog. They have kindly allowed us to share their post here on our blog as well. Leaves and flowers are generally removed from archives or books collection, as this organic material encourages pests, stains paper and can be poisonous, but when they have been pressed between pages for over a century, a different approach must be considered. Herbarium collections can add value and depth to an archive, and can offer a new angle for research. Earlier this year, a herbarium collection of about 20 different plants was found within the Special Collections’ Edward Thomas archive. 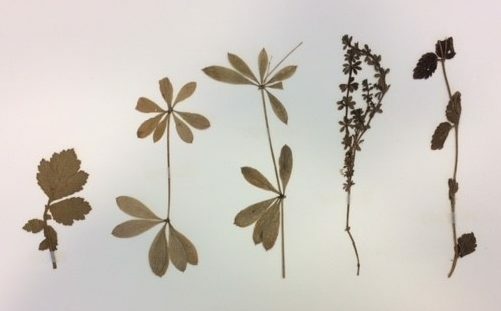 These pressed flowers and leaves were found in three different notebooks dated between 1895-1896, which had been selected to be conserved thanks to generous funding by the NMCT. Nature, and specifically the Welsh countryside, is known to be a major inspiration for Edward Thomas’ works. Edward Thomas’ poem Thaw, 1916. Part of the conservation activity funded by the NMCT grant included hinging the pressed plants with Japanese tissue to micro-chamber board, and encapsulating it, which would give support to the plant and protect it from exterior factors – mainly humidity and pests. Part of any conservator’s job is to do huge amounts of research. I was very curious about herbariums, and came across many research papers warning of previous treatments that could be hazardous. It was common practice, as recently as the 1980s, to treat herbariums with mercury chloride as a disinfectant against pests. It would be applied in one of two ways – soaked, or brushed on with ethanol. Mercury chloride, although once used against syphilis, is extremely poisonous. It can reduce into metallic mercury, which is liquid at room temperature and can vaporise. Mercury vapour can build up to harmful levels when samples of treated plants are kept in boxes or between pages, and the vapour is highly poisonous if inhaled. The World Health Organisation has classified mercury as “extremely hazardous Class 1A”. The emission of mercury vapour from herbariums can be an occupational health hazard for collection workers and researchers. How do you know if the collection has been previously treated with mercury chloride? There are a few ways to test for the presence of mercury chloride. 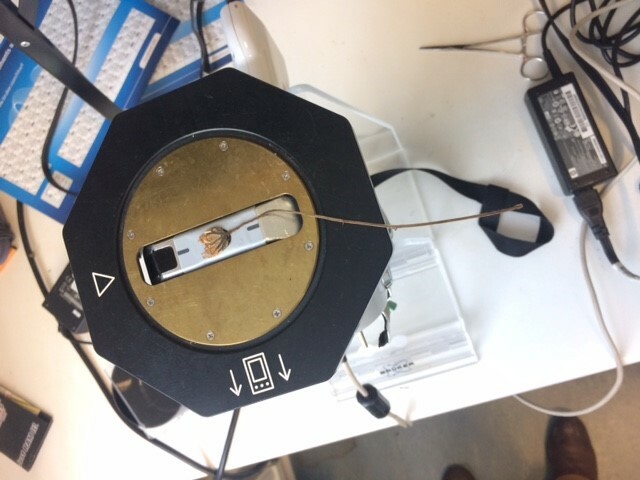 Working in collaboration between Glamorgan Archives, Special Collections and Archives, and Cardiff University Conservation Department, we decided to use the Conservation department’s portable XRF. An XRF is an X-ray Fluorescent Spectrometer that determines what elements are present. It is a non-invasive technique, which is appropriate for rare collections and heritage objects. A flower sample resting on the pXRF. To explain briefly, the X-ray beam affects the atom, which releases a burst of energy that is characteristic of a specific element. This produces a graph which can be analysed. Under the guidance of PhD candidate Chris Wilkins, we tested all the samples. Luckily none of the samples came up with a positive reading for mercury chloride. We also looked for arsenic and lead, other common historical biocides that are classified as hazardous. All of the readings indicated that mercury, arsenic and lead were absent. 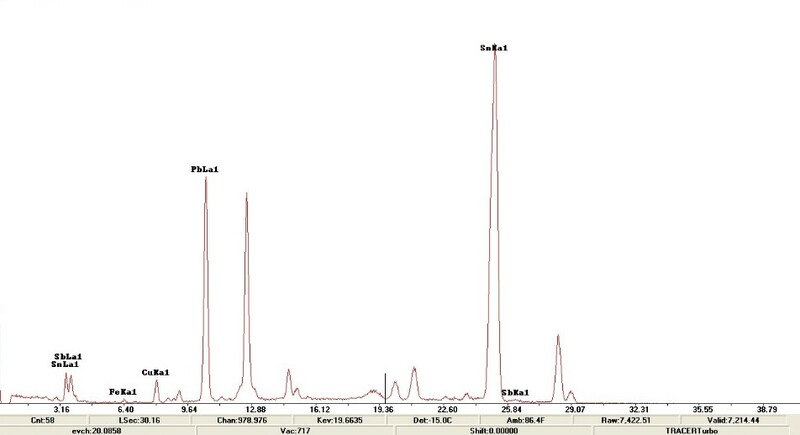 Graph of trace elements from pXRF. Knowing that the herbarium has been tested ensures a safe working environment for archive workers and researchers. It also informs the storage plan for the herbarium. If samples were contaminated, then a form of ventilation would be required to ensure vapour ratios are within UK health and safety regulations. Testing the samples has improved the collection’s accessibility for readers and researchers, and allows further information to be uncovered. Sampling DNA, or categorising the plants would give us a fuller image of Edward Thomas’ landscape in the late 1800s. Samples that have been hinged with Japanese tissue on MicroChamber board, before encapsulation. The herbarium has been encapsulated, and remains between the pages of Edward Thomas notebooks. If you are interested in Edward Thomas’ notes, poetry or the plants that took his interest, they can all be found and explored safely in Special Collections and Archives. Pam has been working on the Edward Thomas Conservation project as a student conservator thanks to the generous support of the National Manuscript Conservation Trust.